Fire departments and EMS agencies are on their toes 24/7 and with that they need to keep track of a wide range of equipment and operation information. 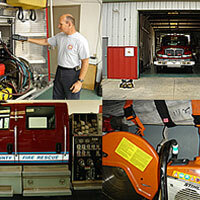 Why fire department inventory management needs our Intelliview™? Well, for the simple reasons it is comprised of a web-based asset and inventory management application and one or more of our RFID tags and reader or barcode labels, hence it is perfect to track inventory and asset management for the fire department. Here the primary module tracks every aspect of the inventory such as equipment, out of service equipment, consumables, expiration dates, pharmaceuticals and maintenance details. Consumable inventory and equipment tracking are some of the Intelliview™ modules that are seamlessly integrated as they offer complete RFID fire department solutions. Our flexible and modular design means it can be used in fire, rescue, and EMS agencies regardless of size and number of locations. In this fast paced environment where efficiency and organization are critical skills, the Intelliview™ software and RFID hardware helps your staff to no longer worry about not being prepared with the right equipment for an emergency situation or accident. Fire rescue and EMS units have a wide range of equipment to take care at their disposal and tracking all that with a hand made inventory can be a major challenge. But with Intelliview™ managing all the equipment and the supplies be automated and will ultimately save the time and money of the employees. Well, what makes it possible is RFID and barcode scanning systems help track every last first aid kit, stretcher and ambulance in the department. Intelliview™ tracks each item by its location, whether it’s on a shelf or engine and our system ensures when you leave the station, your unit or engine is confirmed ready for that emergency or incident. Keeping an accurate count of stock items and will know exactly when to reorder. Use a hand held computer or PDA to scan products as when they arrive. Use RFID and barcode to track of who is using something, where it’s being used and how much is left. Intelliview™ ,informs in advance using email or SMS alert as to when the products will be expiring so that you have time to order a new supply. It also includes other items with expiration dates like IV fluid and catheters, sterile gloves and airways. It ensures that you do not spend hours of your shift keeping track of all the inventory. This much time could be spent on more important administrative duties, when an RFID is used, the entire fire asset management can have reduced to just minutes, as it can provide up-to-the-minute inventory at any time and from any location. Are you spending up to three hours a shift just keeping track of inventory? That’s a considerable amount of time that could be spent on other administrative duties. Using RFID in this process can be reduced to just minutes. Using a hand held computer or PDA to scan the barcoded or RFID tagged products and equipment when they arrive. Keep track of who is using something them, where they’re being used, and how much is left. Using RFID can provide the up-to-the-minute inventory at any time and from any location. The rotational inventory capabilities within Intelliview™ enables you to manage shared equipment. It lets you know exactly who has borrowed the piece of equipment, where it is presently located and on what day it is due. It also allows you to maintain a history of who has used the equipment, any changes made to the equipment’s status, such as maintenance activity or any other important information. Here the important point is whenever an employee takes an equipment they need to quickly scan the barcode or it reads the RFID tag. Doing so a record is immediately created and it can be later used as a reference in case there is a requirement on the piece of equipment. Intelliview™ provides accountability and efficiency in the fire department inventory management otherwise would have to be manually enforced costing another department a lot of time. With our solution your department staff is automatically accounted for expensive critical assets.